In 1977, NASA sent two spacecraft, Voyagers 1 and 2, off into space. Their mission was mainly to gather data, including photographs, about Jupiter and Saturn and their moons, and then to travel on out into space, across the vast emptiness between our solar system and the nearest stars. They are the first probes to leave the Solar System and are the farthest man made object from Earth. 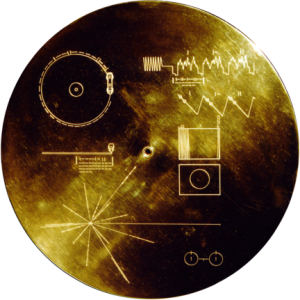 Each Voyager was the size of a small car, and carried what was described at the time as a ‘phonograph record’, with the intention, or at least the hope, that one day in the distant future some extraterrestrial civilization would discover one of the Voyagers, detach the interesting-looking disc and ‘play’ it. They will then hear, if they have ears to hear, amongst other things, a greeting in the Akkadian language, last used in Mesopotamia about 6,000 years ago. On the record is an hour’s worth of sound, including greetings in many Earth languages and various earthly sounds, such as a bus, a tractor, a horse, the sounds of whales, a baby crying, waves breaking on a shore, and a collection of Earth music, including works by Mozart and Chuck Berry’s “Jonny B. Goode”. The disc also contains 115 still photos, including one of a woman eating an ice-cream cone and another of a man eating a piece of pizza. Faced with a disc with a fine groove spiralling from the outer edge to the centre, how are they to know that its tiny variations conceal information about our far-off planet and its preoccupations in 1977? To give the aliens a sporting chance, on the cover of the record NASA printed a picture of a gramophone stylus seen from above and from the side. Since no written instructions would have been comprehensible, the NASA scientists tried to convey in diagrams such information as the way the stylus worked, the need to rotate the disc, what the period of rotation should be, and how to translate the squiggles detected by the stylus into sounds or pictures. And so that the aliens knew exactly where the spacecraft had come from, NASA engraved a map, showing the location of the Solar System in relation to fourteen pulsars, stars with a particular, very precise period of rotation, which would be likely to be known to the aliens. Don’t panic yet at the tought of Aliens turning up on our doorstep becaus we foolishly sent them a map. The earliest we can expect aliens to listen to these records 40,000 years’ time, which is when they’ll reach the nearset possible planetary system. In 1977 the gold plated audio visual disc on the two Voyagers was the latest technology for recording and playing back sound. It must be remembered that the first patent for what became the CD wasn’t filed by Sony until 1980. The pace of technical change is accelerating so fast that the world of AD 42,000 will be unimaginably different from the world of 1977- People might understand NASA’s stylus in the way it’s intended, or they might think it’s a drawing of a train going round a circular track, or they might just pick the record up and throw it to each other like a frisbee. The idea of sending messages out to ‘other planets’ has been revived again in the 21st Century in a project called KEO. Although ‘other planets’ in this case is Earth 50,000 years in the future. Again it will use the latest technology, at the time of launch, to carry the messages from Earth. KEO is effectively a space time capsule which was to have been launched in 2003 carrying messages from the citizens of present Earth to humanity 50,000 years from now, when it would reenter Earth’s atmosphere. It has been delayed and is currently estimated to launch in 2014. The idea is to carry as many messages from as many inhabitants of Earth who choose to participate, encoded in glass radiation-resistant DVDs. Needless to say, the spacecraft will carry instructions for the future recipients on how to build a DVD player. And also needless to say, it can only be a few years before this too will seem as out of date a way of recording and reading data as the Voyager gramophone is today. But unlike the few hours’ capacity on the Voyager disc, the KEO DVDs will have enough space and compression to allow every citizen on Earth today to send a message up to four pages long.